In our continuing series of 24 fan-fiction, our heroes face their greatest challenge yet- helping Bill Buchanan's elderly Aunt Ruth through the transition to digital television. Bill Buchanan bursts through the door of his Aunt Ruth's house. BUCHANAN: Aunt Ruth (heaving, out of breath) I came as soon as you called, what's the emergency? Do you need an ambulance? Aunt Ruth is standing in front of her television set, clicking the tuner around angrily. AUNT RUTH: It's this damn T.V. set, Billy! I've been at this for an hour and I can't get anything to show up- not even the Mexican channels! BUCHANAN: You mean there's no emergency? AUNT RUTH: I can't watch my programs! Of course this is a-- what do you call it, dear? An active code? Buchanan drops his head and does his best to swallow his frustration. He looks up and smiles. BUCHANAN: The T.V. isn't the problem. 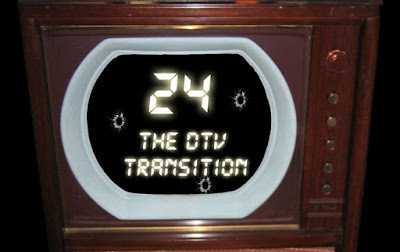 It's the DTV transition taking place, that's why your channels aren't working. BUCHANAN: Let me call a friend over and she'll explain. (opens up his wireless phone, pushes a quick-dial) Chloe, it's Bill- can you come over to my Aunt Ruth's house? (pause) No, she's alright, it's just that I need you to help her through the transfer from analog to digital broadcast television. (pause) Yes, I'm serious... and bring backup if you can. BUCHANAN: Thank God you're all here. Wait, Jack, why are you here? JACK: Your Aunt Ruth still bakes shortbread cookies, right? AUNT RUTH: Don't I ever, come along young man let's set up you with some cookies and milk. JACK: Copy that, Aunt Ruth. Aunt Ruth pinches Jack's cheek and they leave to the kitchen. BUCHANAN (to Chloe and Morris): Since when does Jack eat cookies? CHLOE: He's going undercover as someone that eats cookies so we can do our job! MORRIS (to Chloe): Alright, love, I'm setting up Ruthie's telly for the converter box. Mr. Buchanan, where's the converter? BUCHANAN: She doesn't have one- she's too busy to deal with those details. MORRIS: I guess covering every available piece of furniture in plastic is a full-time endeavour, yes? CHLOE: I've hacked into dtv2009.gov and I'm redirecting the nearest facility to send Aunt Ruth a $40 coupon for her converter box. It should be here within minutes. BUCHANAN: That means one of us has to run down to the store and buy the box once the coupon arrives. (looks at watch) There's not enough time, "Murder, She Wrote" will be on in less than a half-hour. She never misses an episode. MORRIS: We are doing our best, sir. Perhaps we should consider neutralizing the target? Aunt Ruth is at the kitchen counter assembling the cookie dough ingredients. Jack is sitting by the counter in a folding chair. AUNT RUTH: I hear one of your friends talking in the other room, he sounds English, is that right? JACK: Yes, ma'am- that's Morris O'Brian, he's Chloe's husband. JACK: Let's keep those details classified, deal? AUNT RUTH: But Bill tells me you're always asking people so many questions. JACK: Actually, I'd like to know when you bought that stick of butter. Aunt Ruth looks down at the obviously very old butter. AUNT RUTH: Oh, don't worry about that, Jack- all you need to do is cut off the protective layer. (She trims off the outer parts of the butter) Look, it's brand new inside! JACK: You're a good liar, but I've seen better. Excuse me for a moment. Jack leaves to go to the living room. Aunt Ruth goes back to work on the cookie dough. CHLOE: We're 10 minutes away from our deadline and we've got no converter box and no working feed of Angela Lansbury. BUCHANAN: This situation is about to go critical, Jack. Can you get her to bake something else to keep her busy? JACK: I ate things you don't want to know about when I was in China, Bill and I don't think I'll make it past Aunt Ruth's fossilized cookies. MORRIS: Perhaps she needs a little extra attention, mate. Jack look at Morris and grins to himself. Buchanan and Chloe are looking concerned as they hear Morris and Aunt Ruth giggling in the other room. Jack walks back into the living room, smiling. BUCHANAN: Jack, you're a sick man, you know that? My Aunt is 92 years-old and you have her doing... God knows what with Morris?! JACK: Will the both of you knock it off? Morris is in there making up stories about how he lived next to Angela Lansbury in London. He's actually doing a pretty decent job of it too- the guy knows his "Murder, She Wrote" trivia. CHLOE: Okay, Jack, we have the converter box- I'll walk you through the installation. Jack walks over to the television and kneels down. CHLOE: Okay, you're going to run a coaxial line from the back of the converter box to the connection on the T.V. JACK: There's no coax connection on the back of the set, I repeat NO COAX! CHLOE: That's impossible- read to me the T.V. 's model number. JACK: There's no model number, Chloe- this thing was built in the 1960s. Bill, I'm gonna need a hacksaw. BUCHANAN: We're going to need a coax adapter or something. CHLOE: I'll try to source one, but we're talking about some pretty exotic equipment. JACK: I've had enough of this! Jack leaps up, pulls out his pistol and blasts the T.V. set with several bullets. 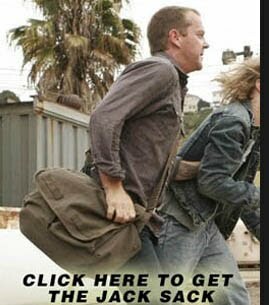 He then puts the gun away and reaches into his wallet, pulls out several hundred-dollars and hands the money to Bill. BUCHANAN: That's great, Jack- just GREAT! You can't shoot your way through every problem, I hope you realize that. Chloe is packing up her gear at this point. Jack is walking to the door. BUCHANAN: You think this is over? Who's going to teach Aunt Ruth how to operate a remote control for the new T.V.? JACK: Understand this, Bill- I don't work for you. Besides, I think Morris can take over from here. BUCHANAN: Good point, let's get out of here. MORRIS: ... and that's how Angela Lansbury won the record for most pidgeons consumed in a single day. AUNT RUTH: That's just fascinating! But enough about her, I want you to look at this. Aunt Ruth hands Morris a box of old letters. Morris reads one of them to himself- his eyes bulging. AUNT RUTH: Can you read those letters to me out-loud? MORRIS: These seem kind of personal, love.. and dirty. Are you sure? Aunt Ruth pulls out a pack of smokes and lights up. I just flashed back to Season 3 when Jack was trying to help Chase... "Roger, i don't have a green wire!" *shudders* that's just... wrong... LOL. Hilarious. I was IN that living room! BTW, how do you tell if butter is old?? Now, I can attest to the existence of old butter- it gets discolored and develops an unpleasant skin. But, like with other things, if you dig below the surface, you'll find something worthwhile and delicious. I was actually riffing on Albert Brooks' movie "Mother" where Debbie Reynolds insists that the sherbet underneath the freezer burn was saved by the protective layer above it.